First off, my Lego Batman Movie review. It started off on a good note, but lost steam halfway through. The jokes got repetitive, it was a bit corny, and there wasn’t the wittiness of the first one. Still ok, but not a must see like the original Lego Movie. Ok, now on to today, I got going at 7:30am, a bit early to compensate for stopping early yesterday. 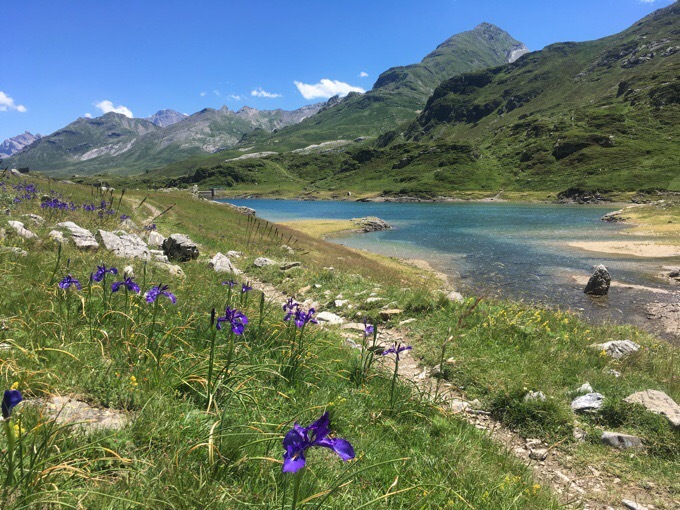 After doing the rest of the hike up to Lac and Col d’Arratille, I was happy I stopped where I did. It was pretty open on the climb with a lot of rock, so there wasn’t a more ideal tenting spot. Still doable, to camp up there, but I like to be more sheltered from possible wind gusts. The climb up was gradual and a nice start to the morning. When I got to Col d’Arratille, JB was there. 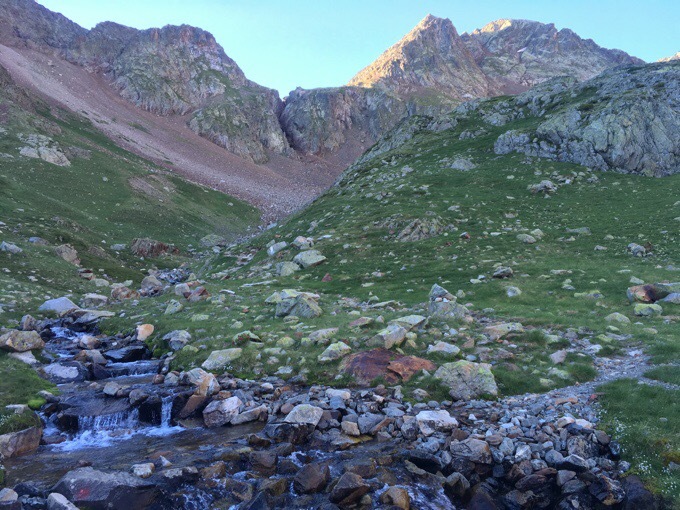 We walked together for about an hour and a half to the next refuge. It was nice to get some time to overlap with one another, and we’ll probably see each other in town. He’s a couple years younger than me and doing his first long hike now that he’s between jobs. He’s absolutely loving it, and the enthusiasm is nice to be around. Like I’ve said before, he says it makes him feel ALIVE. It very much reminds me of when I did the PCT years ago and realized for the first time what it felt like to LIVE. I wish he knew more English or I knew French because I know there was a lot more there, but a limitation in what he could express with the language difference. I’m excited for him. We did the path you can see cutting across the range. 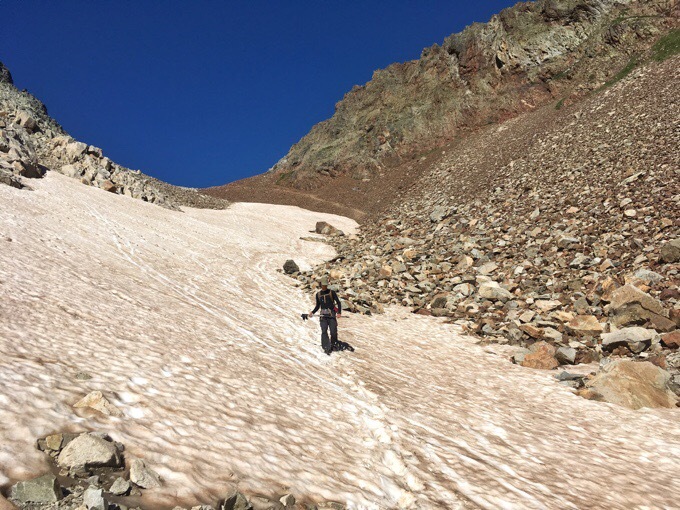 A bit of snow on the way down. 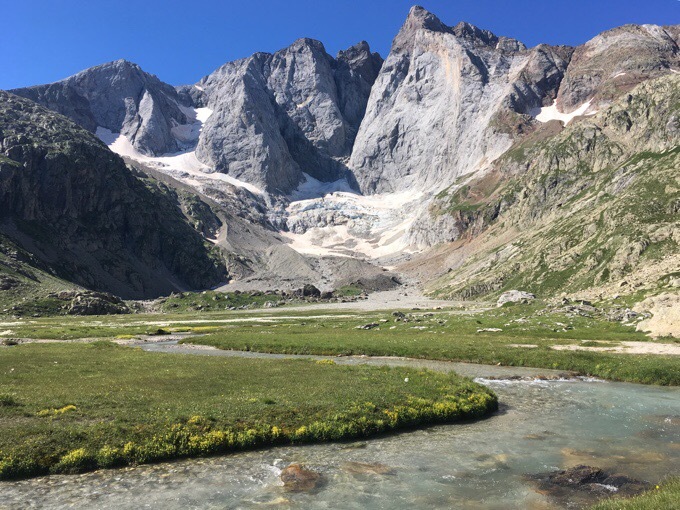 We went down to the picturesque Vallée de Gaube where the Refuge des Oulettes de Gaube is. 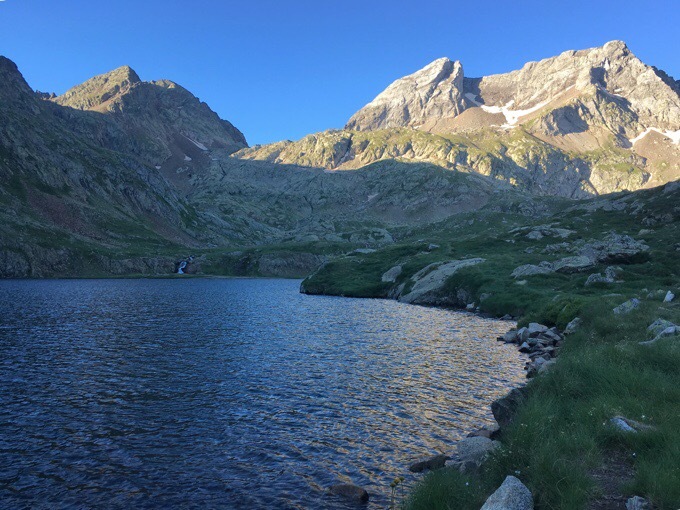 The view from the refuge is of Vignemale, the highest summit on the Spain/France border. Many people were in this area as it’s obviously quite a draw. 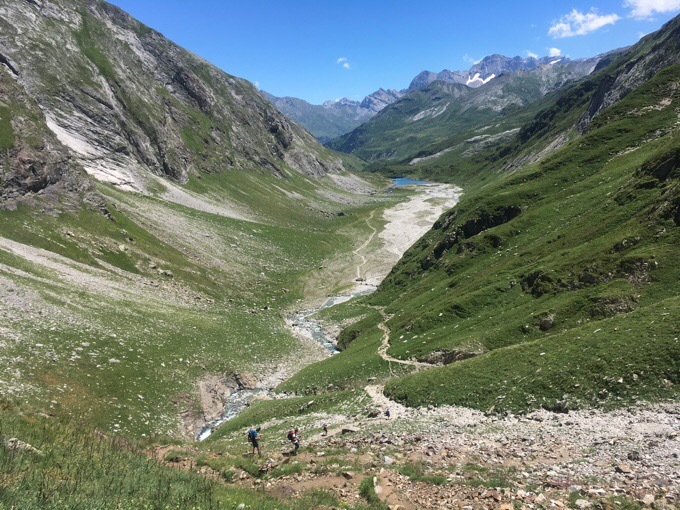 It’s the first time we saw glaciers on the mountains on this hike with the aqua water flowing into the valley. I took a ton of photos today. 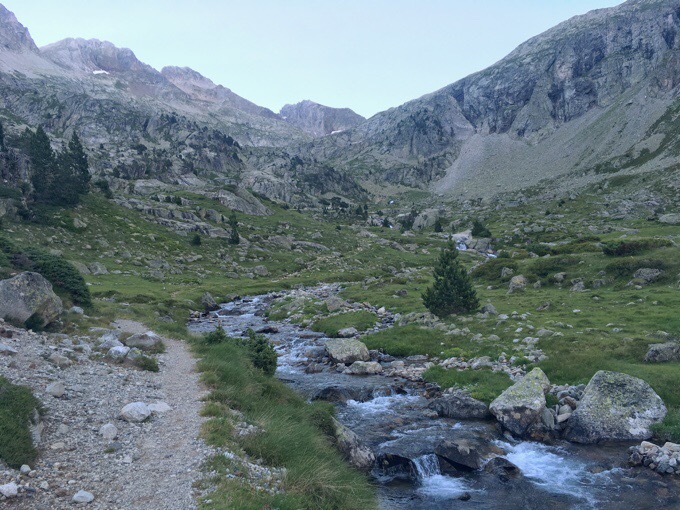 Vignemale, the highest summit on the Spain/France border. 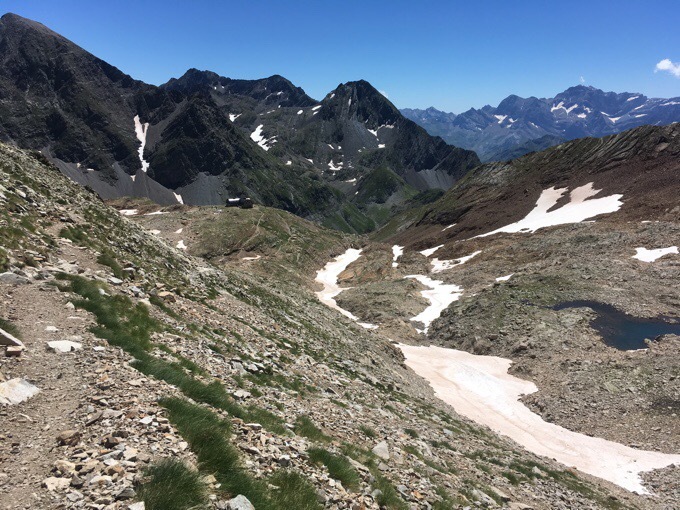 JB stopped at the refuge for coffee and a pastry and I continued on up the long climb to the pass, Hourquette d’Ossoue. 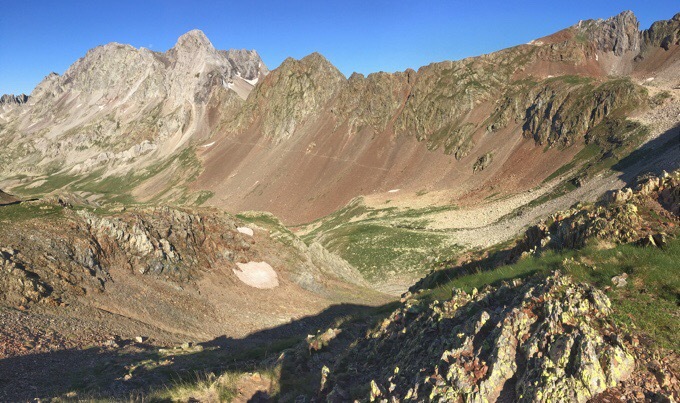 Once up there, many do a side trip to tag the summit of Petit Vignemale, which is what JB planned to do. I was happy to pass on that one. 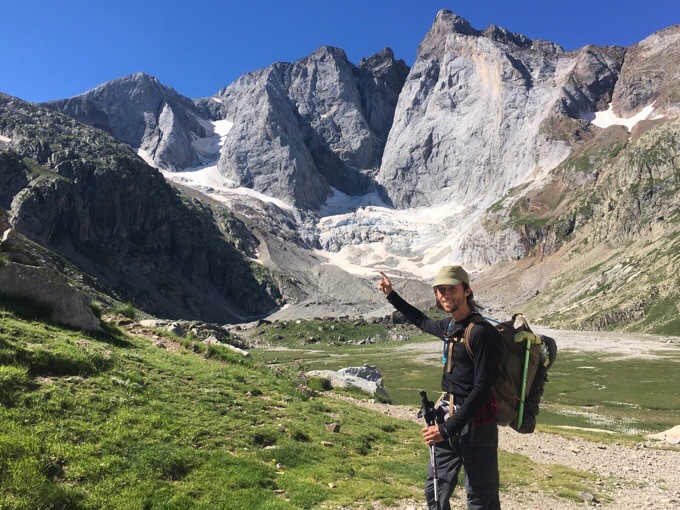 JB pointing towards Petit Vignemale on the far left that he planned to summit. Looking back at the long climb up. 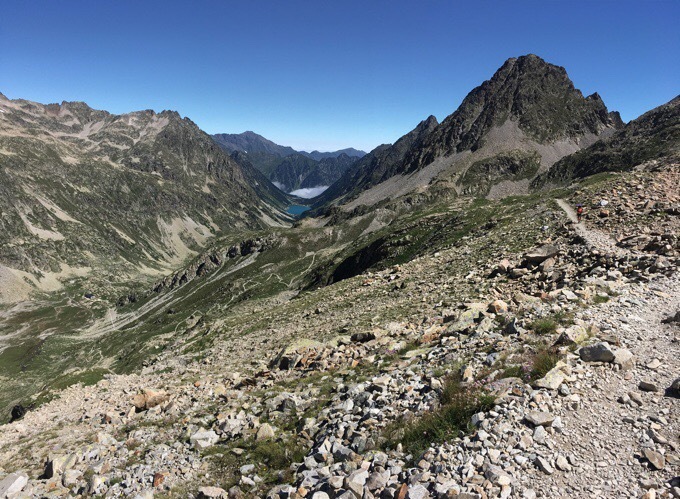 Notice Refuge des Oulettes de Gaube at the bottom of the far switchbacks. Once up on the pass, I found a sheltered spot to have lunch. Not long after I got there, JB arrived full of energy. He caught up quite quickly. He said after his coffee and pastry, he felt like a rocket, ha! I said goodbye to him one last time as I finished my lunch and he went on to do the side summit of Petit Vignemale. On the pass. 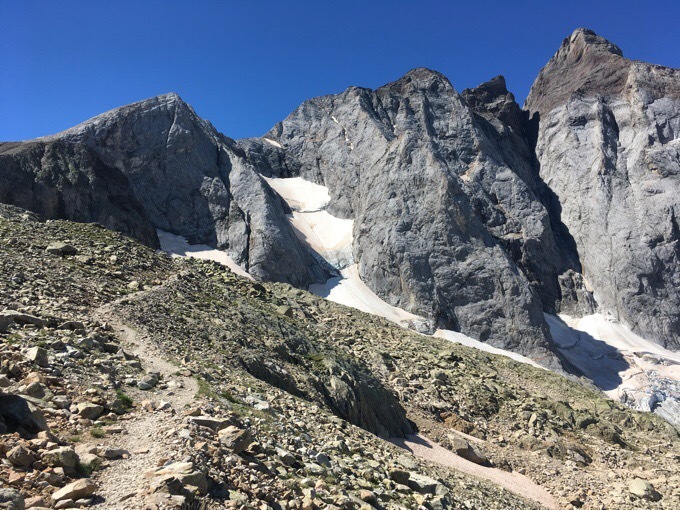 Straight ahead and UP is the path to the summit of Petit Vignemale. 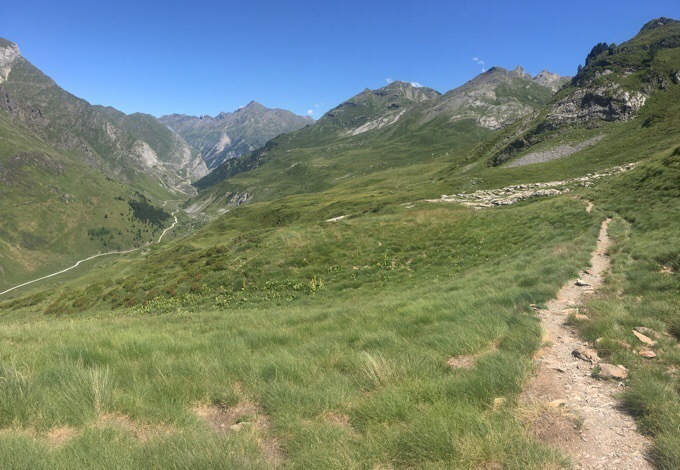 The rest of my day was on the GR10 on a very long and beautiful downhill that wound through a canyon and kept revealing more with each turn. I was awestruck by so much of it and am so happy to be out here! 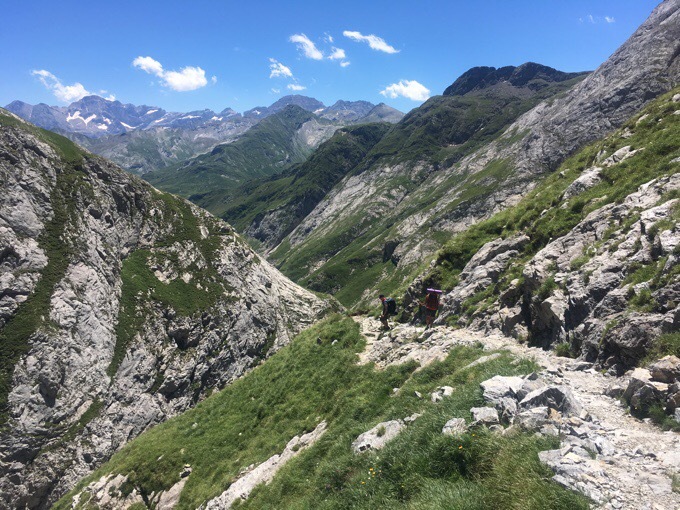 A view of Refuge de Bayssellance on the way down. 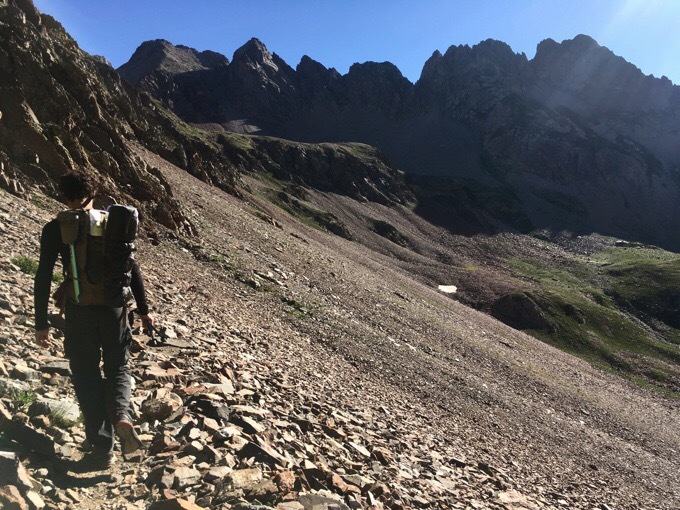 Longtime readers know that I’ve mentioned the term “in the pocket” to describe how I feel often when I’m hiking. Hiking is where I most often feel that I’m in the right place at the right moment, and everything clicks. Switchbacks down and then cutting across the green in the far rock face. It doesn’t need to happen all day everyday, but it happens most consistently and for the longest duration of time when I’m hiking. I think the last time I felt it strongly was when I was on the Bibbulmun a little less than a year ago. These last few days, I’ve really felt it and it’s been great to feel like I’m back on track again. At peace, calm, and so so HAPPY! I’m in the pocket and right where I’m supposed to be. Although it’s been frustrating not to have service to post my blog entries, it’s also been really awesome to just be removed from social media for so many days and be within myself. There will be a ton to do when I get to town tomorrow, but I’m a master procrastinator, so that’s fine by me! 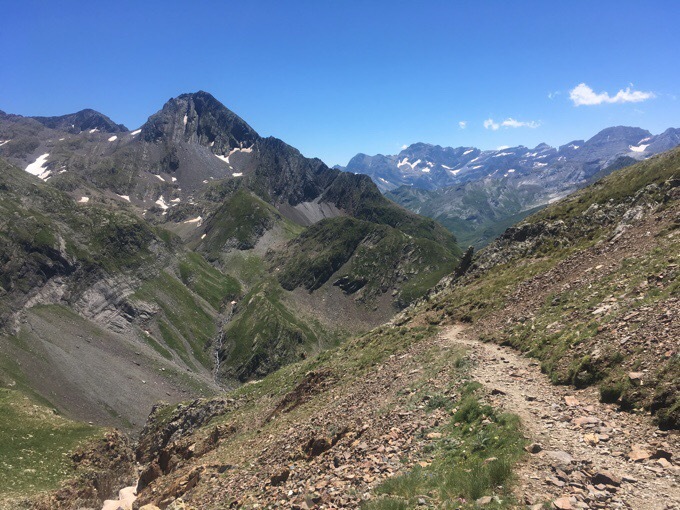 I’m on the GR10 all the way to Gavarnie, which I could have hiked into tonight. I don’t like arriving late in towns, so I stopped about an hour before the village and will go in early tomorrow and spend the night. I like having almost full days in towns. As I mentioned yesterday, the only problem may be that it is Bastille Day tomorrow, a national holiday. 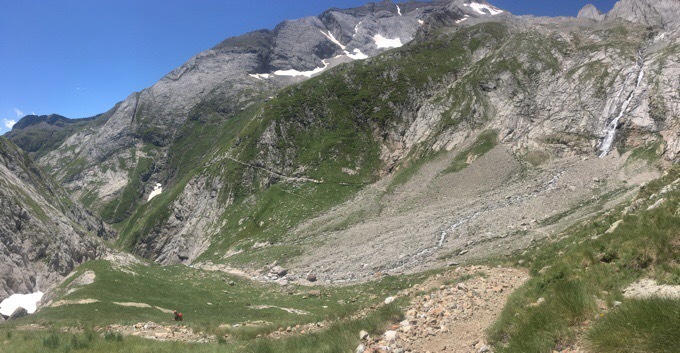 Gavarnie should be packed as a tourist town, but things may be closed. We’ll see. The final hour or two today was a gradual traverse downhill in an open grassy canyon. Finding a level spot to pitch the tent that wasn’t exposed and in lumpy tall grass was the challenge. I found a great spot tucked in with rock walls as shelter. The nightly fog started to grow when I stopped at 5pm. Now at 9pm, I’ve enjoyed watching the fog roll in and out on the grass hills. I seem to be sort of protected with the rocks around me, so I have great crisp air, but no moisture on the tent. Hoping it stays that way! The tent has been remarkably dry every morning this leg…I’m off to watch a couple episodes of Brockmire. A comedy series recommended by a friend that I’ve had fun watching about a washed up MLB baseball announcer giving it another go years later in the minors. I recommend it! I associated bells on animals with wild mountainous areas, so they are always a source of joy for me. I can fully relate to your joy of being in these mountains. Thanks for all the amazing photographs. 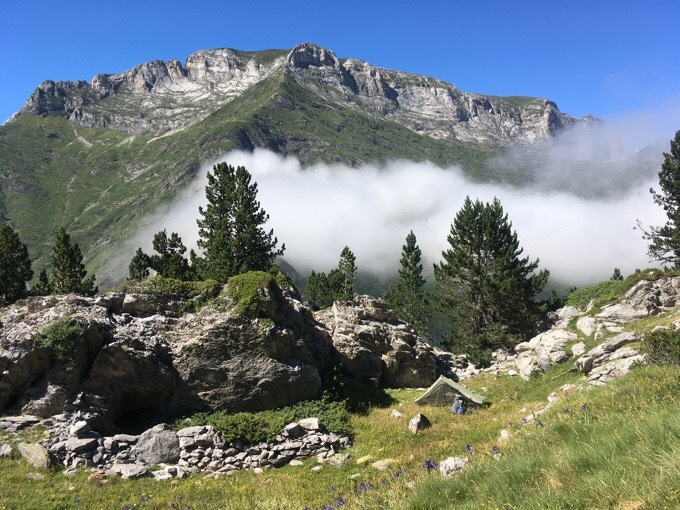 stayed in Refuge de Bayssellance the night of their hundredth anniversary – it was packed!!! GORGEOUS day! I could hang there for a LONG time. Reminds me a bit of a section of the Wonderland Trail, and some photos of the Winds where I’ll be heading shortly. and of course the sierra! Looks like we are seeing the best of Europe that most don’t see. Beautiful.. And you made me think of music I might enjoy in a similar situation. So I just went to YouTube and listened to tracks from Ray Lynch.. His Deep Breakfast album.. Sounds like you were is a special and good place that day! Incredible. Helen Jane Long is in my hiking (and regular life) repetoire as well. Anything off of her album Porcelain is amazing. PS, loving this trail; I do see your reference to the Sierras. I’m headed there at the end of this week. Nice to hear you are in the pocket. 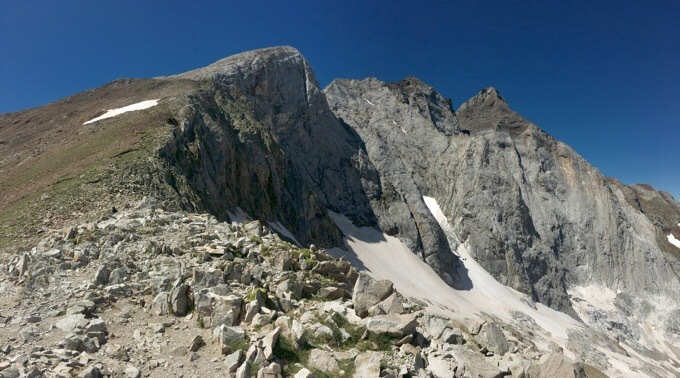 I hope to find that place while hiking in the Sierra in August for 3 weeks.